Watch the sunrise from the master bedroom balcony, sip your morning coffee on the screened-in porch overlooking the bay, relax with a book on the patio. This beautiful bay view beach house has three levels of outdoor living space in a peaceful location, just minutes from the ocean and steps from the pool. This spacious, freshly decorated beach house is located in an upscale resort community. You will enjoy access to countless amenities, including a pool, fitness center, playground, beach volleyball court, shuffleboard, tennis and basketball courts, fishing piers, and a boat/jet ski ramp, with no additional amenity fees. In Fenwick Island, you will find the relaxation you're seeking, along with easy access to the many exciting activities that the Maryland/Delaware seashore has to offer, including the Ocean City, Bethany, and Rehoboth boardwalks, miniature golf courses, excellent restaurants, and much more! Come see why we call it FUNwick! I grew up vacationing at the Maryland and Delaware shore. I love spending time in Fenwick Island and I think you will, too. The view from this home is an awesome blend of bay and wilderness. The location is private and quiet while still being close the action. Fenwick Island is a lovely, family-friendly town with quaint shops and farm-to-table restaurants. The home decor is simple and clean with a beachy vibe. 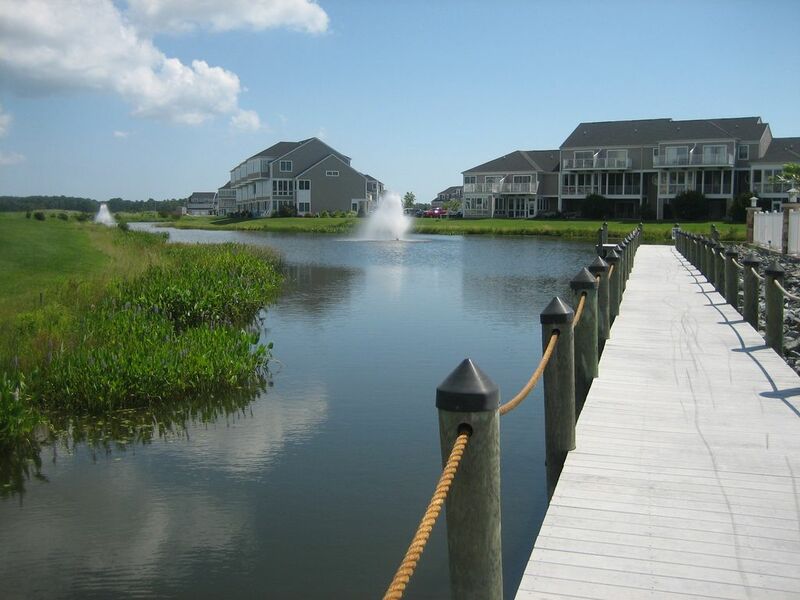 Bayville Shores is a well-maintained community with high-end amenities and beautiful water views all around. Towels and toiletries not provided. Large flat screen cable TV in living room. The townhouse is in a great location, short ride to the OC Maryland. The Community pool and kids playground is less than a minute walk. The townhouse was very clean and spacious. My two children had a great time. The items in the home were nicely labeled, instructions were simple and we didn’t even need to contact anyone for anything. The owner also provided movies and a bunch of games for a few game nights. It was a great trip. Thank you for the great feedback! Please keep us in mind for future rentals. My wife and I stayed with our son and his wife and two children Aug 11-18. Jennifer was pleasant to deal with and the transaction was simple and without problem through VRBO. First this is a great location in a very nice neighborhood. The home is located directly across from the pool and gym making it an easy walk even with small children. The home is nicely decorated and has beautiful views from the decks on the main and upper floors. We found it to be reasonably well equipped and it seemed to be one of the nicer offerings in the area when we booked.. There are two bedrooms on the 3rd level, the main living area/kitchen on the second level, and the first level has another bedroom. So our son and family could be close to their children, my wife and I gave them the master suite and we took the bedroom on the first floor. Here is where the real problem came for us. The queen bed matress on the first tloor is terribly in need of replacement. It is so worn the sag was immediately visible in the center of the bed. It would have been very difficult to sleep on the mattress were that the only issue, but one of the two heat pumps located right outside the sliding door of this room was so noisy it was impossible to sleep. Every time it came on we were awoken. We finally decided to purchase some ear plugs to try to help with the noise. This was a biggest issue with our stay. Our son and his wife said the king bed in the master suite was comfortable and they had no complaints. The mattresses in the other room the kids had seemed fine as well. Aside from the above, we found the cleaning job to be very poor. In the lower level bathroom we found mold on the shower head and a long strand of hair hanging from it, and overall this bathroom just did not seem very clean. (we have photographs but can't post here). The ice maker did not work,the lighting in the kitchen and dining area suffered from a blown bulb in kitchen in just insufficient light due to bulbs. There was no TV in the master bedroom or other upstairs bedroom, and the one in the basement bedroom is very small and both had no HD channels. A better cleaning job, a new mattress, fix A/C noise and this would be a solid 4. With some additional fixes and amenities it would be a 5. Overall we enjoyed our stay, and again Jennifer was great to deal with and no complaints in that regard. Thank you for taking the time to submit your feedback, Roy. I'm glad you enjoyed the location, and were overall pleased with your rental experience. The queen mattress in the first floor room was replaced this week (September 2018) following the rental season as part of upgrades we are making. We also redecorated the bathroom adjacent to that room. And we switched to brighter LED bulbs in many of our light fixtures. I’m sorry to hear there was HVAC noise coming from outside. One of our units was just replaced in June 2018. I wish I had known you were having this experience, I would have contacted our HVAC contractor to see if the issue was coming from either of our two units. Equipment for the neighbor's home is right beside ours and I know they just had their HVAC units replaced in late August. I had friends stay in that room this past weekend and they said there was no noise when any of the units were running, so this seems to have been resolved. Thank you for the feedback on the cleaning service; I have alerted them. Please feel free to contact me directly with any questions you may have or further comments you'd like to share. Thank you again for choosing our property for your vacation. Jennifer is very easy to talk to and very accommodating! The townhouse was very clean and met all of our needs plus some. The community is beautiful and quiet with lots of amenities! We used the pool and playground a lot since we had three little ones with us. We will definitely be staying here again in the future! Thanks so much for your feedback. I'm glad you had a great stay and look forward to renting to you and your family again in the future. Nice place, had everything we needed in the kitchen. Short walk across the street to the pool which was great. Easy drive to the beach in the morning. Would certainly rent again. Thanks for your review. So glad you enjoyed your stay! Fun long weekend stay for a lacrosse tournament. We had two mother/daughter couples stay at this very roomy town home located in a fun community that included lots of activities for the two 10 year olds. They loved the pool, volleyball court and riding their bikes through the neighborhood. We don't care for the craziness of staying in Ocean City. This house was perfect. The drive into northern OC was less than ten minutes. There are lots of bars, restaurants and shops nearby, but the community is quiet and family oriented. Thanks so much for your feedback. Glad you had an enjoyable stay! This 3-floor townhome and all the amenities that were included made this property an absolutely perfect getaway! Everything was new, kitchen was fully stocked with plenty of dishes and silverware, there is a bathroom on every floor, with each bedroom having its own full bath! It was quaint, yet, plenty of room and very very comfortable. We went to the pool at least 3 times, even if just for a quick swim after the beach. The gym was stocked with plenty of equipment and even had a kitchenette! I would rent this property again for sure! Rental fee includes access to all community amenities. Summer rentals are typically Saturday to Saturday. Owner willing to negotiate partial weeks.